Kenya (Lua error in package.lua at line 80: module 'Module:IPAc-en/data' not found. or Lua error in package.lua at line 80: module 'Module:IPAc-en/data' not found. ), officially the Republic of Kenya, is a country in the African Great Lakes region of East Africa. Its capital and largest city is Nairobi. Kenya lies on the equator with the Indian Ocean to the south-east, Tanzania to the south, Uganda to the west, South Sudan to the north-west, Ethiopia to the north and Somalia to the north-east. 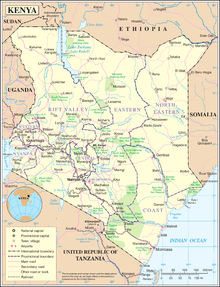 Kenya covers 581,309 km2 (224,445 sq mi) and has a population of approximately 44 million as of July 2012. Kenya has been added to the edit stash. Kenya has a warm, humid climate along its Indian Ocean coastline, with wildlife-rich savannah grasslands inland towards the capital. Nairobi has a cool climate which becomes colder closer to Mount Kenya, which has three permanently snow-capped peaks. Further inland, there is a warm and humid climate around Lake Victoria, and temperate forested and hilly areas in the western region. The northeastern regions along the border with Somalia and Ethiopia are arid and semi-arid areas with near-desert landscapes. Lake Victoria, the world's second largest fresh-water lake and the largest tropical lake, is situated to the southwest and is shared with Uganda and Tanzania. Kenya, along with Uganda and Tanzania is famous for its safaris and diverse wildlife reserves and national parks such as the East and West Tsavo National Park, the Maasai Mara, Lake Nakuru National Park, and Aberdares National Park. There are several world heritage sites, such as Lamu; there are also many world renowned beaches, such as Kilifi, where international yachting competitions are held each year. The African Great Lakes region, which Kenya is a part of, has been inhabited by humans since the Lower Paleolithic period. The Bantu expansion reached the area from West-Central Africa by the first millennium AD and the borders of the modern state comprise the crossroads of the Niger-Congo, Nilo-Saharan and Afro-Asiatic ethno-linguistic areas of the continent, making Kenya a multi-cultural country. 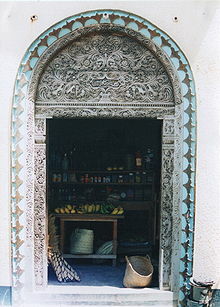 European and Arab presence in coastal Mombasa dates to the Early Modern period; European exploration of the interior began in the 19th century. 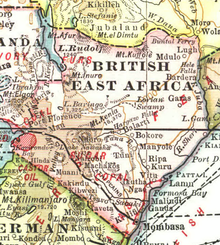 The British Empire established the East Africa Protectorate in 1895, known starting in 1920 as the Kenya Colony. 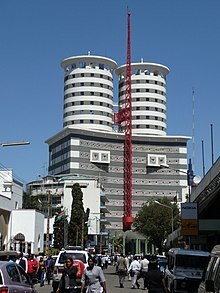 The Republic of Kenya became independent in December 1963. Following a referendum in August 2010 and adoption of a new constitution, Kenya is now divided into 47 semi-autonomous counties, governed by elected governors. Until the country gained independence from Britain, its name was pronounced "Keen-ya", but at Independence the pronunciation was changed to "Ken-ya". The word Kenya, Lua error in package.lua at line 80: module 'Module:IPAc-en/data' not found., originates from the Kikuyu, Embu and Kamba names for Mount Kenya, "Kirinyaga", "Kirinyaa" and "Kiinyaa". Prehistoric volcanic eruptions of Mount Kenya (now extinct) may have resulted in its association with divinity and creation among the indigenous Kikuyu-related ethnic groups, who are the native inhabitants of the agricultural land surrounding Mount Kenya. In the 19th century, the German explorer Ludwig Krapf recorded the name as both Kenia and Kegnia believed by some to be a corruption of the Kamba version. Others say that this was—on the contrary—a very precise notation of a correct African pronunciation Lua error in package.lua at line 80: module 'Module:IPAc-en/data' not found.. An 1882 map drawn by Joseph Thompsons, a Scottish geologist and naturalist, indicated Mt. Kenya as Mt. Kenia, 18620. Controversy over the actual meaning of the word Kenya notwithstanding, it is clear that the mountain's name became widely accepted, pars pro toto, as the name of the country. The "Big Five" animals of Africa can be found in Kenya and in the Masai Mara in particular: the lion, leopard, buffalo, rhinoceros, and elephant. A significant population of other wild animals, reptiles and birds can be found in the national parks and game reserves in the country. The annual animal migration – especially migration of the wildebeest – occurs between June and September with millions of animals taking part. Fossils found in East Africa suggest that primates roamed the area more than 20 million years ago. Recent findings near Kenya's Lake Turkana indicate that hominids such as Homo habilis (1.8 and 2.5 million years ago) and Homo erectus (1.8 million to 350,000 years ago) are probable direct ancestors of modern Homo sapiens, and lived in Kenya in the Pleistocene epoch. During excavations at Lake Turkana in 1984, paleoanthropologist Richard Leakey assisted by Kamoya Kimeu discovered the Turkana boy, a 1.6-million-year-old fossil belonging to Homo erectus. Previous research on early hominids is particularly identified with Mary Leakey and Louis Leakey, who were responsible for the preliminary archaeological research at Olorgesailie and Hyrax Hill. Later work at the former site was undertaken by Glynn Isaac. Around 500 BCE, Nilotic speaking pastoralists (ancestral to Kenya's Nilotic speakers) started migrating from present-day Southern Sudan into Kenya. 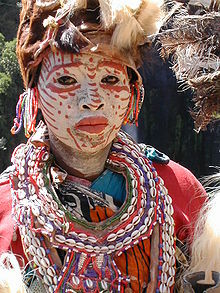 Nilotic groups in Kenya include the Samburu, Luo, Turkana, Maasai. By the first millennium CE, Bantu-speaking farmers had moved into the region. The Bantus originated in West Africa along the Benue River in what is now eastern Nigeria and western Cameroon. The Bantu migration brought new developments in agriculture and iron working to the region. 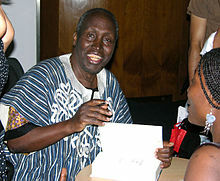 Bantu groups in Kenya include the Kikuyu, Luhya, Kamba, Kisii, Meru, Aembu, Ambeere, Wadawida-Watuweta, Wapokomo and Mijikenda among others. Also of note are the "vanished" Sirikwa people, prominent in the Great Lakes until the 15th Century CE. From October 1952 to December 1959, Kenya was under a state of emergency arising from the Mau Mau rebellion against British rule. The governor requested and obtained British and African troops, including the King's African Rifles. The British began counter-insurgency operations; May 1953, General Sir George Erskine took charge as commander-in-chief of the colony's armed forces, with the personal backing of Winston Churchill. At Kenyatta's death in 1978, Daniel arap Moi became President. Daniel arap Moi retained the Presidency, being unopposed in elections held in 1979, 1983 (snap elections) and 1988, all of which were held under the single party constitution. The 1983 elections were held a year early, and were a direct result of an abortive military coup attempt on 2 August 1982. In 2002, Moi was constitutionally barred from running, and Mwai Kǐbakǐ, running for the opposition coalition "National Rainbow Coalition" — NARC, was elected President. Anderson (2003) reports the elections were judged free and fair by local and international observers, and seemed to mark a turning point in Kenya's democratic evolution. Kenya ranks low on Transparency International's Corruption Perception Index (CPI), a metric which attempts to gauge the prevalence of public sector corruption in various countries. In 2012, the nation placed 139th out of 176 total countries in the CPI, with a score of 27/100. However, there are several rather significant developments with regards to curbing corruption from the Kenyan government, for instance, the establishment of a new and independent Ethics and Anti-Corruption Commission (EACC). The new office of the PM will have power and authority to co-ordinate and supervise the functions of the Government and will be occupied by an elected MP who will be the leader of the party or coalition with majority members in Parliament. The world watched Annan and his UN-backed panel and African Union chairman Jakaya Kikwete as they brought together the former rivals to the signing ceremony, beamed live on national TV from the steps of Nairobi's Harambee House. 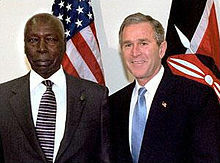 On 29 February 2008, representatives of PNU and ODM began working on the finer details of the power-sharing agreement. Kenyan lawmakers unanimously approved a power-sharing deal 18 March 2008, aimed at salvaging a country usually seen as one of the most stable and prosperous in Africa. 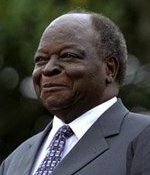 The deal brought Kibaki's PNU and Odinga's ODM together and heralded the formation of the grand coalition, in which the two political parties would share power equally. Incumbent President of Kenya Uhuru Kenyatta. East and Central Africa's biggest economy has posted tremendous growth in the service sector, boosted by rapid expansion in telecommunication and financial activity over the last decade, and now contributes 62% of GDP. Unfortunately, a massive 22% of GDP still comes from the unreliable agricultural sector which employs 75% of the labour force (a consistent characteristic of under-developed economies that have not attained food security – an important catalyst of economic growth) and a significant portion of the population regularly starves and is heavily dependent on food aid. Industry and manufacturing is the smallest sector that accounts for 16% of the GDP. Kenya's services sector, which contributes 61% of GDP, is dominated by tourism. The tourism sector has exhibited steady growth in most years since independence and by the late 1980s had become the country's principal source of foreign exchange. Tourists, the largest number from Germany and the United Kingdom, are attracted mainly to the coastal beaches and the game reserves, notably, the expansive East and West Tsavo National Park (20,808 square kilometres (8,034 sq mi)) in the southeast. Tourism has seen a substantial revival over the past several years and is the major contributor to the pick-up in the country's economic growth. Tourism is now Kenya's largest foreign exchange earning sector, followed by flowers, tea, and coffee. In 2006 tourism generated US$803 million, up from US$699 million the previous year. Presently, there are also numerous Shopping Malls in Kenya. 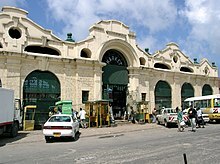 In addition, there are two hypermarkets in Kenya. 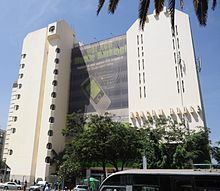 The Kenya Commercial Bank headquarters at KENCOM House in Nairobi. The largest share of Kenya's electricity supply comes from hydroelectric stations at dams along the upper Tana River, as well as the Turkwel Gorge Dam in the west. A petroleum-fired plant on the coast, geothermal facilities at Olkaria (near Nairobi), and electricity imported from Uganda make up the rest of the supply. Kenya's installed capacity stood at 1,142 megawatts between 2001 and 2003. The state-owned Kenya Electricity Generating Company (KenGen), established in 1997 under the name of Kenya Power Company, handles the generation of electricity, while Kenya Power handles the electricity transmission and distribution system in the country. Shortfalls of electricity occur periodically, when drought reduces water flow. To become energy sufficient, Kenya aims to build a nuclear power plant by 2017. Kenya has proven deposits of oil in Turkana and the commercial viability was just discovered. Tullow Oil plc estimates Kenya's oil reserves to be around 10 billion barrels. Exploration is still continuing to determine if there are more reserves. Kenya currently imports all crude petroleum requirements. Kenya, east Africa's largest economy, has no strategic reserves and relies solely on oil marketers' 21-day oil reserves required under industry regulations. Petroleum accounts for 20% to 25% of the national import bill. Sizeable minorities of other faiths do exist (Muslim 11.2%, irreligious 2.4%, indigenous beliefs 1.7%). Sixty percent of the Muslim population lives in Kenya's Coastal Region, comprising 50% of the total population there. Roughly 4% of Muslims are Ahmadiyya, 8% Shia and another 8% are non-denominational Muslims, while 73% are Sunni. Western areas of the Coast Region are mostly Christian. The upper part of Kenya's Eastern Region is home to 10% of the country's Muslims, where they constitute the majority religious group. In addition, there is a large Hindu population in Kenya (around 300,000), who have played a key role in the local economy, they are mostly of Indian origin. There is also a small group of Baha'is. Diseases of poverty directly correlate with a country's economic performance and wealth distribution: Half of Kenyans live below the poverty level. Preventable diseases like malaria, HIV/AIDS, pneumonia, diarrhoea and malnutrition are the biggest burden, major child-killers, and responsible for much morbidity; weak policies, corruption, inadequate health workers, weak management and poor leadership in the public health sector are largely to blame. According to 2009 estimates, HIV prevalence is about 6.3% of the adult population. However, the 2011 UNAIDS Report suggests that the HIV epidemic may be improving in Kenya, as HIV prevalence is declining among young people (ages 15–24) and pregnant women. The total fertility rate in Kenya is estimated to be 4.49 children per woman in 2012. According to a 2008–09 survey by the Kenyan government, the total fertility rate was 4.6% with contraception usage rate among married women was 46%. Maternal mortality is high, partly because of female genital mutilation. This practice is however on the decline as the country becomes more modernised and the practice was also banned in the country in 2011. 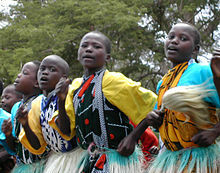 Kenyan boys and girls performing a traditional dance. The guitar is the most dominant instrument in Kenyan popular music. Guitar rhythms are very complex and include both native beats and imported ones, especially the Congolese cavacha rhythm. Popular Kenyan music usually involves the interplay of multiple parts, and more recently, showy guitar solos as well. 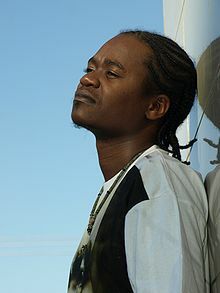 There are also a number of local hip hop artists, including Jua Cali. Ugali and sukuma wiki, staples of Kenyan cuisine. Kenyans generally have three meals in a day – breakfast in the morning (kiamsha kinywa), lunch in the after noon (chakula cha mchana) and supper in the evening (chakula cha jioni). In between, they have the 10 o'clock tea (chai ya saa nne) and 4 pm tea (chai ya saa kumi). Breakfast is usually tea or porridge with bread, chapati, mahamri, boiled potatoes or yams. Ugali with vegetables, sour milk, meat, fish or any other stew is generally eaten by much of the population for lunch or supper. Regional variations and dishes also exist. Lua error in package.lua at line 80: module 'Module:Portal/images/k' not found. ^ a b c d e Central Intelligence Agency (2012). "Kenya". The World Factbook. Retrieved 28 May 2013. ^ Kenya GDP purchasing power 2010: 66 Billion. Imf.org. 14 September 2006. ^ Glynn Llywelyn Isaac, Barbara Isaac (1977). Olorgesailie: archeological studies of a Middle Pleistocene lake basin in Kenya. University of Chicago Press. p. xiii. ^ Ehret, C. (1998) An African Classical Age : Eastern and Southern Africa in World History, 1000 BCE to 400 CE., University Press of Virginia, Charlottesville, pp. xvii, 354, ISBN 0813920574. ^ Don Nanjira, Daniel (2010) African Foreign Policy and Diplomacy: From Antiquity to the 21st century, ABC-CLIO, p. 114 ISBN 0313379823. ^ "Sultan of Malinda, PBS". Pbs.org. Retrieved 16 April 2010. ^ "Ismaili muslim". Magicalkenya.com. Retrieved 16 April 2010. ^ "Political – Welcome to THE Kenya Document Exchange". Kenyadocex.com. Archived from the original on 28 August 2010. Retrieved 1 August 2010. ^ Moreno, Pedro C. (ed.). "Kenya". Handbook on Religious Liberty Around the World. Charlottesville, VA: The Rutherford Institute. ^ "Agreement on the Principles of Partnership of the Coalition Government". Kenya National Dialogue & Reconciliation. Retrieved 3 June 2013. ^ "Kenya MPs opt to scrap prime minister position". BBC News. 28 January 2010. Retrieved 16 April 2010. ^ "Kenyans back change to constitution in referendum". BBC. 5 August 2010. Retrieved 6 August 2010. ^ Gettleman, Jeffrey (5 August 2010). "Kenyans Approve New Constitution". The New York Times. Retrieved 11 August 2010. ^ Pigeonpea in Eastern and Southern Africa. ICRISAT Posted 10 October 2012. Downloaded 26 January 2014. 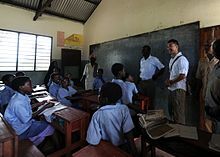 ^ McGregor, Sarah (20 September 2010) Kenya Aims to Build a Nuclear Power Plant by 2017. bloomberg.com. ^ Kenya From Nowhere Plans East Africa’s First Oil Exports: Energy. bloomberg.com. ^ BBC News – Kenya oil discovery after Tullow Oil drilling. Bbc.co.uk. 26 March 2012. ^ a b c d e "Country profile report – Kenya" (PDF). United Nations. 2009. ^ "World Water Day Focus on Global Sewage Flood". News.nationalgeographic.com. 22 March 2010. Retrieved 10 February 2012. ^ Boseley, Sarah (8 September 2011). "FGM: Kenya acts against unkindest cut". London: The Guardian. Retrieved 7 January 2012. ^ a b c d "Education". Ministry of Information and Communications. Government of Kenya. Retrieved 23 April 2011. ^ "Nakuru upset KCB in Kenya Cup". Nation.co.ke. 25 July 2009. Retrieved 16 April 2010. ^ "Fast food finds fans in sub-Sahara Africa, where obesity problem is growing – World News". Worldnews.nbcnews.com. 24 October 2012. Retrieved 26 February 2013. This page was last edited 09:06, 5 December 2014 by Wikipedia user Eloquence. Based on work by Wikipedia user Steven Walling.